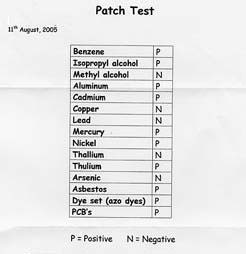 CTS Originals* can analyze your used BodyPure pads (ideally one of the first 5 pads) to identify the toxins present. The syncrometer, an electronic device used to detect individual substances by using a circuit and matching frequencies. The following substances have been identified in the used pads through this method: benzene, isopropyl alcohol, methyl alcohol, aluminum, cadmium, copper, lead, mercury, nickel, thallium, arsenic, asbestos, DAB dye, fast green dye, sudan black dye and PCB (plastic byproduct). Click Here for sources and descriptions of common toxins.